India Gate, situated on the Raj Path in New Delhi, was built to memorialize the 70,000 Indian soldiers who lost their lives during the First World War, fighting for the British army. The India Gate also bears the name of 13,516 British and Indian soldiers killed during the third Afghanistan war, 1919. The foundation stone of India Gate was laid down by the Duke of Connaught in the year 1921 and was designed by the famous British architect, Edward Lutyens. It was Lord Irwin who dedicated India Gate to the nation in 1931. Later, another memorial, Amar Jawan Jyoti or the eternal soldier's flame was added to the monument. The Amar Jawan Jyoti is burning since 1971 to remind the nation of soldiers who laid down their lives in the Indo-Pakistan war of 1971. The India Gate is 42 m tall and the entire arch stands on a low base of red stone and rises in stages to a huge molding. From the base of the arch of India Gate one can have a magnificent view of the Rashterapati Bhavan (the President's house). At the top of India Gate, on both sides is inscribed INDIA. There is a vast expanse of lush green lawns surrounding the India Gate. 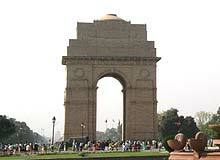 India Gate is certainly one of the most visited spots of Delhi. The lawns of India Gate bustle with people, particularly during summer evenings. The lawns of India Gate house the famous boat club and a children's park. It lends more beauty to India Gate.